A teenage mother has been arrested in Imo state for selling her baby for N120,000. She was paraded alongside two child traffickers for various crimes. Speaking on the matter, the State Commissioner of Police, Chris Ezike, said that one Chiamaka Njoku, 18, of Umuokpo Emeabiam Owerri West LGA of Imo state, took in outside wedlock, gave birth on December 10, 2017 and sold the baby girl at the cost of #120,000.00. "She was impregnated by unidentified man out of wedlock. She left her parents house and was harboured by Okere Justice of the same address who contacted one Franca Chukwukere, the Proprietress of an illegal orphanage, Franca Gold Orphanage Lagos, where she remained until on 10/12/2017 when she put to bed. The baby girl was sold out at the cost of #300,000 and the sum of #120,000 sent to Chiamaka Njoku through Justice Okere. 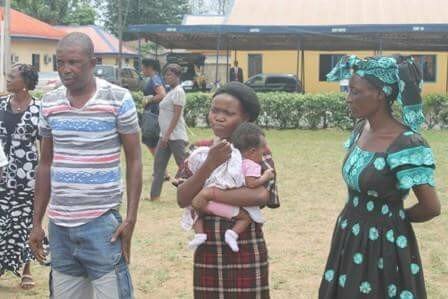 Two baby girls of one month three weeks and one month two weeks old respectively were recovered from the child trafficker" said Ezike.